Organizations are giving it out all over the world to help reverse malnourishment in children. Two to three packets a day provides all of the necessary daily vitamins and calories. Steve has a case of it here and brought a package to dinner as a conversation-starter. I opened it up and we passed it around. We had three little Kenyan boys with us and the youngest, Thomas, ripped the package completely open and licked it clean...yes, it's that good! Can you imagine that? A life can be SAVED by $35! It sounds a lot like a Calteen (sp) bar from Mean Girls. 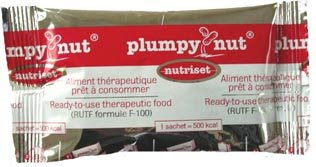 Maybe THAT'S my problem... too much Plumpy Nut!! !